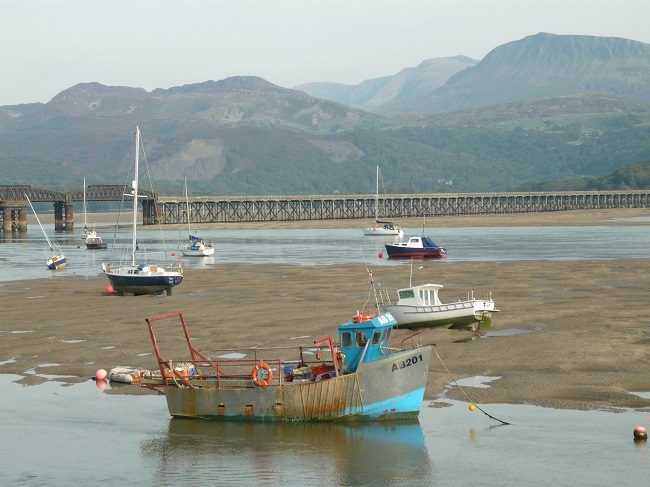 Low tide, high hills . . .the Mawddach River at Barmouth, Wales Romance brought us lads tripping to Barmouth, one of North Wales’ 1001 scenic spots. It’s not Valentine’s Day-type romantic excess. More a quintet on a quest – five chaps confirming yet again that, yes, our yesterdays are a uniting force. It’s a little bit romantic, I think, to be thus adding another link to the chain that connects us. On the fringe of Snowdonia, it was grey hair and grins. We had all been in grey shorts and long socks on starting at Brighton, Hove and Sussex Grammar School in the summer of 1959. That first day was extremely warm for September, one of us recalls. Fifty-six years on it was not exactly sweltering in the last days of September 2015. It was balmy, sort of. Sunny, definitely. Stroll-friendly. Months before this muster I had been warned that the west coast of Wales could be wet and windy. As someone who has lived in Wales, I know all about that. A howling gale and rain during our stay would have been less romantic. Of the Fab Five, I tend to be the one bossing us all to turn up, but there’s a logistical/logical reason for this. Three live in England, so it’s up to me, living in Australia, to fix and then suggest a time when I’ll definitely be in the northern hemisphere and therefore able to join the party. I’m writing this on Valentine’s Day 2016, which nudges me to mention wives/partners. They were with us in Barmouth. So within our group there were couples, ladies’ alliances and gender-based banterings, all added to the mix. Quite a brew. The women don’t share our long history. They don’t tell nearly so many jokes. But surely romance is . . .
I’m looking forward to borrowing these four mates again….inviting them to the dance whose steps we know well, taking their partners for a foxtrot of familiarity. For a fuller account of this schoolboy reunion, click here.